January 2019 - AutoStore continues to gain traction in the market by delivering high-density storage, outstanding application flexibility and unrivaled reliability. Pairing AutoStore with the most appropriate picking solution for your operation, including robotic picking, can unlock the true potential of AutoStore. One of the biggest challenges e-commerce companies face is managing growth, both sustained and seasonal. 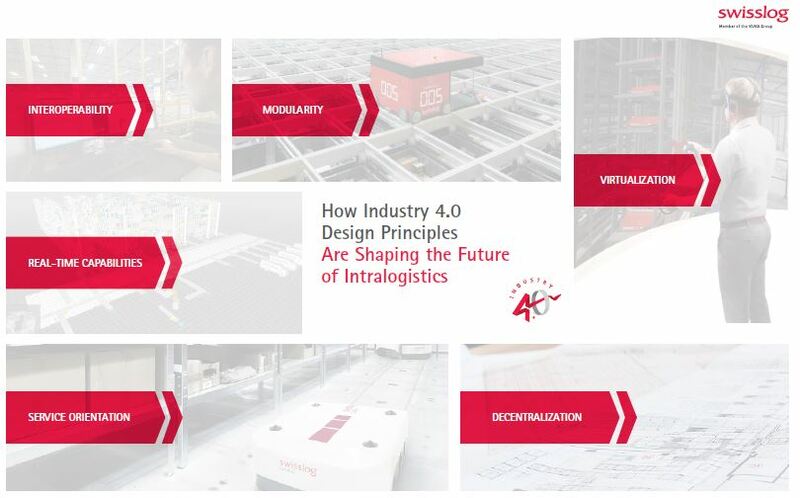 Proper planning, combined with the use of intelligent, modular robotics, allows e-commerce warehouses to efficiently respond to changing demand while minimizing the risks associated with the current labor market. September 2018 - Advances in sensing, vision, gripping and navigation technology have opened new applications for robotics in the warehouse. Today’s robotic warehouse systems offer the speed and productivity of traditional automation with lower costs and greater flexibility. July 2018 - The impact of e-commerce and consumer expectation for greater choice and faster delivery continues to push the evolution of the warehouse. This current phase of evolution is being led by intelligent automation that focuses on flexible and scalable technologies that deliver performance benefits. May 2018 - The production intralogistics process is highly inefficient. The processes for receiving, storing and transporting materials and parts to and from various stages of manufacturing still use the same legacy systems that have been in place for decades. This is unacceptable in today’s hypercompetitive, dynamic markets. May 2018 - Many businesses assume they need to “start small” when it comes to warehouse automation. Unfortunately, by focusing exclusively on small improvements, you may miss opportunities to gain competitive advantage in costs and customer service. If interim investments are not part of a planned larger final system, they could be a false start. April 2018 - From demographic shifts and increasing urbanization to drones and 3D printing, social and technology changes are putting pressure on supply chain managers to move goods closer to consumers and develop warehouses with the flexibility and speed to support local, faster delivery through multiple channels. February 2018 – We are now entering the fourth industrial revolution. Industry 4.0 is changing how we interact with machines and how those machines interact with each other. This will have a significant impact on the warehouse. November 2017 – A hyper-local distribution strategy can help traditional U.S. retailers keep pace with growing consumer demand for greater selection and faster delivery. Repurposing existing or closed retail space as hybrid retail/ distribution hubs streamlines fulfillment and gives consumers more control over the delivery or pickup of their orders. October 2017 – New approaches to warehouse storage are helping companies in a variety of industries manage inventory in less space and at lower costs. Carrier-based robotic systems combine high density with high throughput to deliver an attractive solution that can meet the increasing storage demands of today’s warehouse. October 2017 – Automation can streamline serialization management as raw materials move through production and from production to distribution. April 2017 – Find out how goods-to-person solutions can set new standards in your e-commerce order fulfillment facility. March 2017 – Warehouse automation is driving incredible improvements in productivity and accuracy. But how can you ensure it doesn’t drive up energy consumption too. October 2016 – How much automation is enough? An over engineered system increases complexity, but under engineer the system and you could stifle future growth. So how do you find your sweet spot? August 2016 – Costs associated with optimizing distribution centers are often carefully evaluated, but the alternative is rarely scrutinized. What is the cost of doing nothing? June 2016 – Return handling costs are a global issue. Even where labor is cheap, returns can mean double logistics costs (shipping and reverse logistics), no turnover and disappointed customers. April 2016 – Keeping up with rapid changes in new technology and growth in operations makes it difficult to quickly hire the right employees with the right skills. February 2016 – Learn about the five key tactics we recommend to optimize your DC for ever-growing numbers of SKUs in e-commerce and multi-channel fulfillment. December 2015 – Understanding the financial impact of SKUs is vital for any company. Decide which SKUs go into your distribution center based on how they contribute to the bottom line. October 2015 – Existing distribution centers often face complex challenges, but looking closely at the operation helps you understand all underlying issues before considering an overhaul. September 2015 – Pick or sort? It may seem like a simple decision, but in reality, you need to take multiple factors into consideration when choosing a strategy to meet rapidly expanding retail fulfillment needs.